“Brilliant! Powerful, moving, funny.. deeply touched. Well cast and spot on timing. We had a fantastic night! Thank you.” Gabrielle Jasmin Baker, audience, Zu, Lewes. It’s Sunday lunch, and where the roast should be, there’s a tofu wiener casserole instead. Albert, a butcher, is mortified and questions his wife Jean who has put it on the table. One of their twins, Mark, a vegan, and his opinionated vegan spiritual-midwife girlfriend Julie, are coming to lunch, and Albert takes it all very personally. Twin sister Maddy, is on her way too, with 16yr old daughter, Hannah, who has an intense personal secret she needs to share. Everyone is converging on Albert’s house, including beef-farmer Pete, (father to Hannah’s dreamy boyfriend, Andy), abattoir worker Dave, (and his set of large knives), Andy himself, Sam (Albert and Jean’s youngest, just back from fighting in Afghanistan, and bearing frightful news) and the spirits of some of the animals that Dave, Pete and Albert have, between them, been instrumental in dispatching. All is set for a monumental clash of beliefs, values, knives,… and hearts. “Loved The Last Lunch! I was educated, amused and surprised with the countless twists and turns! Great play that totally surprised me. Good luck on your tour wowwing audiences across the country. I recommend this play to anyone. Well done!” Magnus Agugu Audience, Zu, Lewes. On the farm. one boy spends hours, listening to the animals, their cries and calls to each other, to the wind and to the Gods. 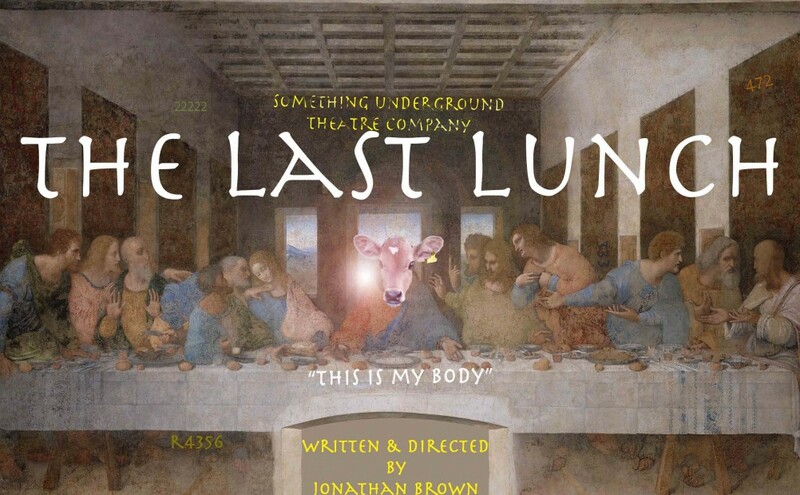 In The Last Lunch, butchers and vegans find strange common ground, and common ancient knowledge, locked away in tombs buried for millennia Now deeply hidden secrets must emerge, and new disturbing secret pacts must be made. A blood blessing is required. To seal the family in, for ever. “thought last night was an absolute delight! Well done. Never thought I would be moved to tears, as we all were, by a chap telling us how close he got to a young male cow… amazing.” Gavin Graham, Audience, Brighton. “Loved the play – what a twist..certainly makes me glad I don’t come from a butcher’s family!” Jane Travis. “I loved the way that you had written & directed the play so that episodic scenes didn’t “wait” for one to finish and another to begin; instead you juxtaposed episodes repeatedly so that, in true Shakespearean fashion, the audience gained insights in advance of what the various characters knew. But……….. little did the audience know! Revelation didn’t predict the ending! Very clever! That overlaying of episodes made the audience think, kept them backtracking to “see” or seek explanations and connections. That overlaying also made us laugh at one utterance or mannerism and simultaneously gasp and recoil. I also liked the subtlety whereby you drew us towards certain characters so that we’d take them to be the main players only to find you refocusing our attentions on other seemingly “minor” characters. It kept us on our toes, kept us guessing. Whoever designed the table had it just right; not so much a prop but part of the story. I thought all the actors had been well cast. And I came away with many ideas about your play. Thank you Jonathan! You are a bright guy and I wish you and the Company all the Very Best.” Diana Moon. Helen Lunt, Audience, Glastonbury and Bridgwater.